Home > Divisions > Late Models > Ryan Unzicker gets first UMP DIRTcar Summer Nationals win at Spoon River Speedway! Ryan Unzicker gets first UMP DIRTcar Summer Nationals win at Spoon River Speedway! CLICK HERE FOR MORE PHOTOS FROM SPOON RIVER SPEEDWAY! Canton, IL – July 12, 2010 – Persistence pays off. 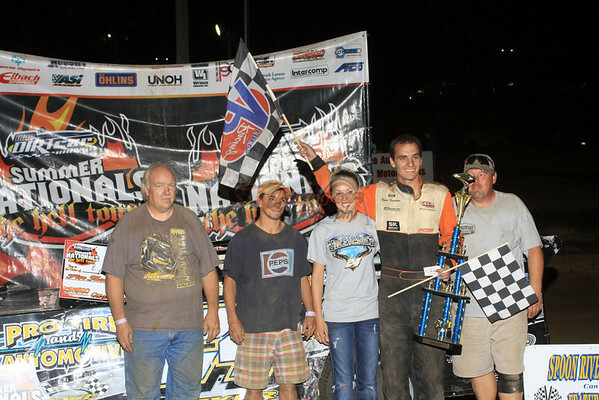 Ryan Unzicker is living proof of that after capturing his first career Hell Tour win Monday night at Spoon River Speedway during the 24th stop of the month long tour. The perennial DIRTcar Summer Nationals competitor, Unzicker of El Paso, Ill., was patiently aggressive using the low line to reel in a lead duo of point leader Jason Feger of Bloomington, Ill. and Greenbriar, Ark., driver Jack Sullivan midway through the 40-Lap main event. Unzicker would overtake Feger on lap 26 and later Sullivan on lap 28 and cruise the rest of the way to claim a $5,000 winner’s check. Third starting Tim Lance of Brimfield, Ill., would cross the line second ahead of Feger. Previous night winner Jeep Van Wormer of Pinconning, Mich., would finish fourth after sliding back earlier in the feature event. Former Hell Tour champion Shannon Babb of Moweaqua, Ill., would round out the top five. Up next for the DIRTcar Summer Nationals Tour is a visit to Peoria Speedway on Tuesday July 13, 2010. In total the Hell Tour has traveled over 4,400 miles in the course of 26 nights. The trip from Canton, Ill., to Peoria Speedway in Peoria, Ill., will have drivers traveling just 30 miles east to the track which will serve as 25th race of the 2010 tour.